LOS ANGELES -- The Chicago Blackhawks built the majority of their Stanley Cup championship team through the draft. And to keep their team fresh, they're holding fast to that plan. The Blackhawks made nine picks on Day 2 of the 2010 Entry Draft on Saturday, selecting the full gamut of players -- North Americans and Europeans, goalies and scorers. It was a necessary process for General Manager Stan Bowman, who already has had to move three players off his Cup-winning roster this offseason. "We have to build through the draft," Bowman said. "You saw we had to move some guys out of here that we really didn't want to, but that's what happens with the (salary) cap. You have to have young guys come up and replace those players. The plan is for these guys in the next couple years … some of them are going to be ready before other ones. That's what we were looking for, to replenish our supply. We have a lot of young guys already, but I think the key was to fill the pipeline again." 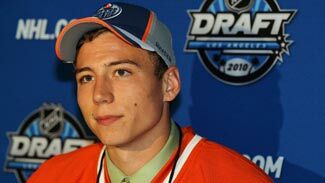 After settling the Tyler vs. Taylor debate Friday night, the Edmonton Oilers came into Day 2 of the 2010 Entry Draft looking to continue to stockpile talent. They started the day by nabbing Minnesota State center Tyler Pitlick, who was available with the 31st pick despite being ranked No. 18 by NHL Central Scouting. With two more second-round picks, they selected 6-foot-4 Slovakian defenseman Martin Marincin and Saskatoon Blades forward Curtis Hamilton. They added 6-3 Ottawa 67s center Ryan Martindale with the first pick of the third round, and 6-2 Acadie-Bathurst Titan defenseman Jeremie Blain with the first pick of the fourth round. "We wanted to get bigger, that was our mandate from Steve, to get bigger, to find character, guys who want to compete," Oilers head scout Stu MacGregor said. "That's what we wanted to achieve and I think we did." With 2008 first-round pick Jordan Eberle and '09 first-round pick Magnus Paajarvi-Svensson poised to join the team, Taylor Hall might not be the only player from the '10 draft class to stick in Edmonton in the fall. "I think form a size and compete level, from a skill-set level, Taylor Hall, Pitlick, we've got help right down the middle, which we need," GM Steve Tambellini said. He started that process with four second-round picks. At No. 35, he selected big Swedish left wing Ludvig Rensfeldt, NHL Central Scouting's fifth-rated European skater. At No. 54, the pick was Minnetonka (Minn.) High School defenseman Justin Holl. At No. 58, the Blackhawks took Everett Silvertips goalie Kent Simpson, and at No. 60, the choice was U.S. National Team defenseman Stephen Johns. The common denominator for those four players is size -- they average 6-foot-3 and about 190 pounds. And that doesn't include Jimmy Hayes, the older brother of first-round pick Kevin Hayes; the Hawks acquired Jimmy from the Toronto Maple Leafs for the No. 43 pick. He checks in at 6-5 and 210 pounds. "Size is always good," Blackhawks Director of Amateur Scouting Mark Kelly said. "We say going into the draft we want to make sure, when we average it out, we have good size. (Kevin) Hayes is 6-2 1/2 and going to get taller, and then we got his brother. And then it kept coming. Holl has good size and he's a terrific skater. Johns has great size, he's a really good skater. The Flick kid (fourth-round pick Rob Flick) has real good size (6-2, 205)." Bowman also was happy with the two goalies he took, Simpson and seventh-round pick Macmillian Carruth of the Portland Winterhawks. "We were talking about taking one goalie earlier and another guy late who we project might have a chance and we were able to get both those guys," Bowman said. "Goaltending is the most important position. We're happy where we're at." It's no secret the Blackhawks needed to offload a few contracts to open salary-cap space, but Bowman said after this week's trade that sent Dustin Byfuglien, Ben Eager and Brent Sopel to the Atlanta Thrashers, he was in a good position and didn't need to make any more moves. That didn't mean he didn't take calls offering more picks for roster players. "We had opportunities, but we had a lot of picks," Bowman said. "It comes to a point where I didn't want to accumulate more picks than we had. It becomes a timing thing. You don't want to have 12 guys who are all coming due for a contract at one time. You want to balance it out over time. We had opportunities to move other players and we listened. Just never came to be. "We don't have to move anybody. We might, but we're not in a crunch where we have to do things." Bowman said he next will set his sights on free agency, which starts July 1. Unlike last year, when the team signed Marian Hossa to a 12-year contract, he won't be active for the big-name, high-salary players this year. That doesn't mean he won't do a little picking through the bargain bin. "We're in a different spot this year," Bowman said. "We're not going to be getting the top-notch free agents because of our situation. We have some situational needs we need to fill. We have to find the right guy and at a lower dollar amount there are going to be guys in that bracket, so you have to find the guy that fits the best."